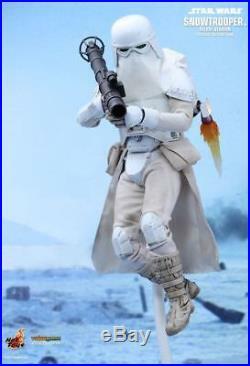 1/6 Star Wars Battlefront Deluxe Double Snowtrooper Figure Hot Toys VGM 24 25. CHECK OUT GREAT RANGE OF BRANDS. PLAY ARTS KAI (SQUARE ENIX). We offer a great range of Collectibles, Figures & Statues. Like Hot Toys, Sideshow, Threezero 3A, Neca, Kotobukiya, Play Arts Kai, Bandai, Takara Tomy, etc. Can't find the one you want? No worries, drop us a line or message and we can hunt one down for you. Check Out Our Novelties & Gadgets. Check Out Our Range of Parts & Accessories. 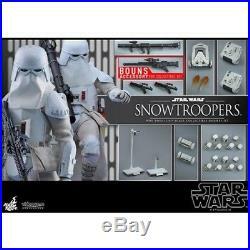 Dont miss out on these Hot Toys Snowtrooper figures VGM24 (Deluxe) or VGM25 (Double Set). The Snowtrooper is an iconic specialized trooper in the Star Wars galaxy. 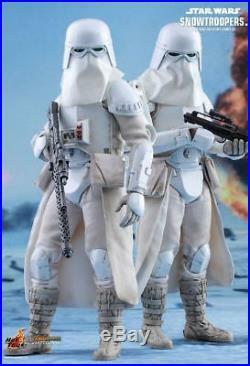 This elite Imperial attack force is equipped with specialized protective gear and heavy armaments, which give them the advantage in frigid environments such as the icy world of Hoth. Hot Toys introduces the Deluxe Version of the 1/6th scale Snowtrooper collectible figure based on their appearance in the popular game Star Wars Battlefront! 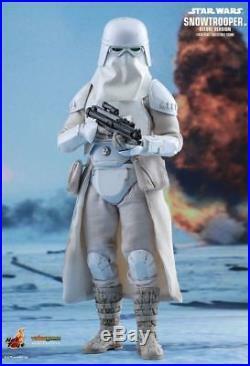 The highly accurate collectible figure features finely crafted classic Snowtrooper armor with weathering effects, a detailed helmet with fabric breather hood, a removable survival backpack, an E-11 blaster, and a specially designed snow-themed dynamic figure stand ideal for aerial poses. The Deluxe Version also comes with a bonus Smart Rocket and a magnetically attached jetpack for more variety of display options. We strive to post out your order out as fast as we can. Orders are dispatched from our warehouse daily from Mondays to Fridays. We send out all our items using Australia Post Registered e-Parcel. It requires a signature when you receive the parcel. Please note that postal delays can happen at times which is beyond our control. It is highly recommended that you contact your local custom for more information. A signature is required when you receive the parcel. We will do our best to resolve the issue for you. All items are inspected and carefully hand-packed before dispatching. As with standard courier practice, you should check the contents of the parcel before signing for your goods. If you do not we can't be held responsible for any damage that may have occurred in transit. We always aim to provide you with the best service, advice, and products at the best prices. All our products are 100% genuine and we never provide you with misleading information on our website. We will do our best to get back to you within 24-48 working hours. Scifitoys Australia is based in Vermont Australia and specialises in top quality and superior figures and toys, HIGH END collectables, Movie Masterpieces, comics, TV shows, games, and sci-fi heritage generally. We as a company began in the year 2009 with major specialisation in Star Wars movie masterpieces like lightsabers and other top premium Star Wars toys. Presently, our variety has broadened to include limited edition collectables, action figures, original replicas, official merchandise and apparels from helmets to costumes made by reputable brands like Sideshow, Hot Toys, Play Imaginative, NECA, Hasbro, Square Enix, Medicom, Kotobukiya, DC Collectibles, Bandai, Aoshima, Takara Tomy, Hot Wheels, Rubies, EFX and more. In case you are a big fan of sci-fi movies like Star Wars movies, superhero movies by Marvel and DC, Terminator, Predators and Transformers, you have appeared in the correct place. Visit and search through our collection now for the best Star Wars toys, Predator toys, Batman toys, Iron Man Toys, Avengers Toys, or looks for your favourites. We respond to inquiries, emails within 24-48 hours (weekdays). Our products are individualy inspected and packed carefully to prevent damage. For peace of mind, We only use trackable and registered (signature required) post. Then no need to search again, because Scifitoys is here to offer what you have been searching for with 100% GUARANTEED SATISFACTION. Can't find the Toys your want? Drop us a message/line and we are happy to source one for you. We at Scifitoys are constantly working hard towards offering you the best quality products, prices, and shopping adventure, so if there is any support you need or to find out more information, or in case you have any relevant issues you have experienced or requests bothering you concerning us, please don't be reluctant to get in touch with us and we will be glad to provide any help. Is based in Vermont Australia and is your one-stop shop for all things Pop Culture suitable for the entire family! Do drop by to see what we have in store and say hello or have a chat with us. We do try our best to respond as promptly to emails as possible, however sometimes (especially for School holiday & Public holiday periods) there may be a slight delay in message replies. You may also contact our Facebook message service outside of work hours. To our newsletters for new listings, special promotions, and other information. Scifitoys ensures your parcel are packed and wrapped carefully to prevent damages to its contents. Australia Post eParcel (Registered Post + Tracking) - Australia Post eParcel Express (Registered Post + Tracking). Please note that there are at times where postal delays can be experience with Australia Post (especially during peak season) which is beyond our control. You can also save heaps when having your orders combined. Some countries may experience some slightly longer delays due to custom processes. If you are experiencing difficulties, try using a desktop instead of mobile. Scifitoys strives to solve any issues that may arise as soon as possible. All orders are normally carefully inspected to be new, unopened/sealed (unless stated otherwise) with no damages before dispatch. We will consider your request and encourage you to follow the appropriate steps below in returning the goods back to us. Goods remained unopened, in its original completely new, re-saleable state with all authentic packaging, all accessories and other material(s). After we admit and consider your request, you will be provided with an address to return the goods. We have many packing staff and unfortunately if an order has not been manually joined, they may be sent out separately. If you would purposely like to have your items sent out separately, please let us know. Scifitoys have discount offers every now and then, so please subscribe to our newsletter for any updates. Listing and template services provided by inkFrog. 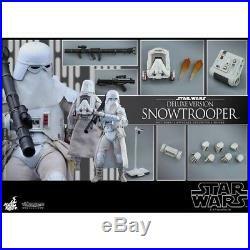 The item "1/6 Star Wars Battlefront Deluxe Double Snowtrooper Figure Hot Toys VGM 24 25" is in sale since Thursday, September 21, 2017. This item is in the category "Toys, Hobbies\Action Figures\TV, Movie & Video Games". The seller is "scifitoys_store" and is located in vermont. This item can be shipped to Australia, North, South, or Latin America, all countries in Europe, all countries in continental Asia, New Zealand.